What’s your strategy for 2015? In its simplest form, strategy is a bridge for getting from where you are today to where you want to go. Whether in business or in your personal life, strategy is how you plan to get from your current position to your desired goals. A bridge provides passage over a gap—something that’s missing. For many of us, there are gaps in our lives—things that are missing, things that we’d like to have more of, such as more time with family and friends, more purposeful work, a healthier lifestyle, and greater spirituality. Strategy can help us fill those gaps. A bridge also spans barriers. Think about the barriers you face, the obstacles and adversity—a difficult coworker, making your financial numbers at work, weakening relationships with your kids, high cholesterol, and so forth. Strategy can help us span and overcome these obstacles. Think about where you are today. Do you enjoy your job? Is your mind active and fully engaged? are you physically healthy? Are your finances solid? Are your relationships inspiring and supportive? Now think about the bridge that led you to your current position. Was it planned and well thought-out, or was it more similar to Alaska’s infamous Gravina Island Bridge, often referred to as the $398 million “bridge to nowhere”? The average working adult spends about fifty hours a week working and commuting to work. Multiply those fifty hours by fifty weeks, and you have 2,500 hours a year that are potentially being wasted in a role that’s either not fulfilling, not enjoyable, or both. Over the course of a career, that’s more than 100,000 hours! We all have resources to varying degrees, consisting of time, talent, and money. How we use those resources each day determines our level of happiness and success in four areas: mind, body, relationships, and finances. Are you investing your time in activities that keep your mind actively engaged? Are you investing your talent in work that is valued? Are you investing yourself in relationships that strengthen the bonds of family, friends, and colleagues? A Gallup survey confirmed just how widespread the lack of individual strategy has become. Canvassing its database of 1.7 million employees, Gallup found that only 20 percent feel their jobs match up with their strengths. That is, only two out of ten people believe they have an opportunity each day to do what they’re best at. If we haven’t planned to match our passions and strengths with our professional and personal lives, then we can only watch with regret as our days slip away like the grains of sand in an hourglass. In the world of business, strategy can make or break a company. Research by Paul Carroll and Chunka Mui showed that the number one cause of bankruptcy is bad strategy. Companies of all shapes and sizes have closed their doors because they didn’t have a plan for success—particularly in economic downturns. If you don’t have a strategic plan today, you may not have a business tomorrow. The same holds true for individuals. Sports Illustrated reported that 60 percent of professional basketball players are in serious financial trouble within five years of retirement, despite earning millions of dollars a year while they held that job.3 according to Yahoo! Sports, Scottie Pippen, named one of the top fifty NBA players of all time, lost his career earnings of $120 million in bad investments. Still think having lots of money protects you from personal bankruptcy? The sobering fact remains, if you don’t have a strategy, you may not have a future—at least, not the one you want. My new research with 2,257 adults of all ages found only 15 percent of adults have a written plan for their life that outlines their goals and the strategies for achieving them. Based on this representative sample, we can conclude that fewer than two out of every ten Americans have a plan for their life. Data has shown that organizations without a sound strategy go bankrupt. In the long run, they fail. 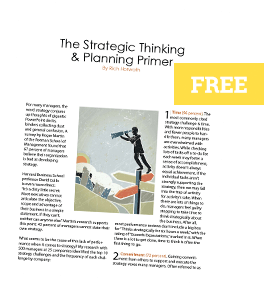 Despite the overwhelming evidence that a business needs a strong strategic plan to survive, by far the majority of people working in business haven’t applied those same strategy principles for success to their personal lives. Why? No one has ever shown them how. 1. DISCOVER: Uncover your purpose through insight. 2. DIFFERENTIATE: Identify your unique strengths. 3. DECIDE: Allocate your resources. 4. DESIGN: Develop your action plan. 5. DRIVE: Execute your plan. As you move from one point in life to the next, you choose your destination and build your bridge. Without a strategy, or bridge, you have no clear way to get where you want to go. Without a strategy, you risk falling into gaps and being held back by obstacles. Without a strategy, you are powerless to create the life you want. With a strategy, there are no limits to how far your bridge can take you. Strategy is the power to get from where you are today to where you want to go–the power to live strategically. Do you have that power?